Product prices and availability are accurate as of 2019-04-25 23:00:40 EDT and are subject to change. Any price and availability information displayed on http://www.amazon.com/ at the time of purchase will apply to the purchase of this product. 50-55 days. Also called Napa cabbage, One Kilo Slow Bolt has a delicate flavor, a soft texture in between that of lettuce and regular cabbage, and is easy to digest. This variety produces sooner than other varieties and is slow to bolt. Ideal for short seasons and quick cropping. 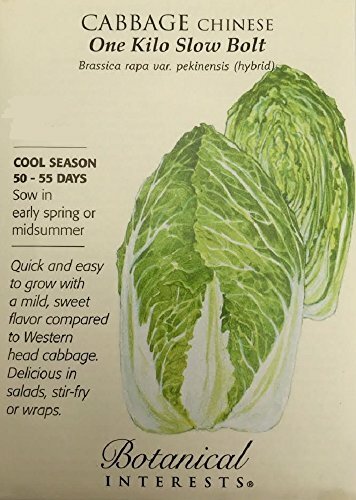 Sow in spring or in late summer for a fall crop of full-sized cabbages. Grows best at 60°F - 65°F.